Regulations requiring the installation of carbon monoxide alarms in homes in England are to be reviewed to ensure they are still "fit for purpose". There are about eight million alarms in England. Since 2010, they are mandatory for new solid fuel appliances, like those using wood and coal. The review will examine if this should be extended to gas and oil appliances. It will consider the cost of devices, ranging from £10 to £100, and whether this is affecting installation rates. 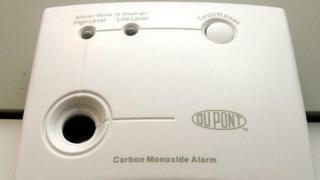 Carbon monoxide is known as the "silent killer" as it is invisible and odourless. According to official figures, accidental carbon monoxide poisoning resulted in more than 50 recorded deaths in England and Wales in 2015 and 200 hospitalisations. Since 2015, private landlords have been required to have alarms in any room "used as living accommodation" in which a solid fuel appliance, such as a boiler or wood-burning stove, is in use. MPs, led by Conservative Eddie Hughes, have been pushing for these requirements to be extended to all social housing tenants. Housing minister Dominic Raab said the review would focus on the adequacy of existing laws and whether they were giving residents in both private and public housing sufficient protection. "Carbon monoxide can be a silent killer and my top priority is to ensure people remain safe and protected in their own homes," he said.